So after a loooong day trooping at the MOSH Sci-Fi event I was getting myself ready for a late night troop at the Murray Hill Theater, someplace I had never be to before. 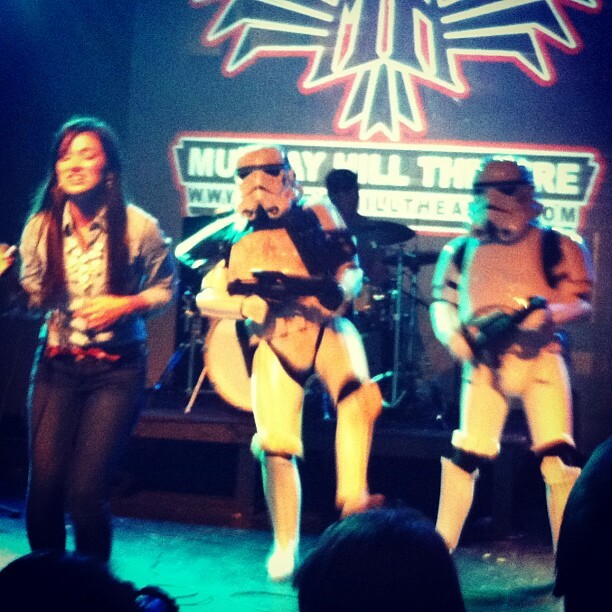 I didn’t know what to expect, but the 501st was invited by a band called The Blank Canvas to join them at the end of the night to mingle with the crowd. When I got there I realized that was a younger mans scene. But hey I was here for the long haul and little did I know at the time that I would be selected to jump on stage with the band along with BJ Savage. I will post more photos if I can find or get some at a later data. So Check back to see if there was an update. also please comment on any of the pages you see, let me know what you think or if you have any questions. One last thing if you like it then like it up and give a page rating as well. it all helps and well makes me feel good lol..
Are you for hire?? I know a lot of kids who love to have you at their birthday parties! No, Sorry but you can request us to come to your event just by submitting a request. we would be glad to show up to the event and have fun with the kids.